(Newser) – One of the world's greatest scientific minds has now left this dimension. British cosmologist and physicist Stephen Hawking has died at the age of 76, some 55 years after he was diagnosed with motor neurone disease at 21 and given two years to live. 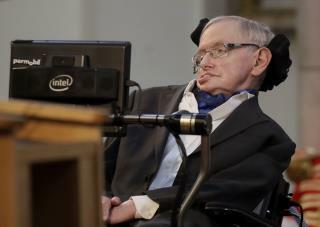 Family members say Hawking died peacefully early Wednesday at his home in Cambridge, England, the BBC reports. "We are deeply saddened that our beloved father passed away today. He was a great scientist and an extraordinary man whose work and legacy will live on for many years," children Lucy, Robert, and Tim said in a statement, per Sky. "He once said: 'It would not be much of a universe if it wasn't home to the people you love.' We will miss him forever." I'd say the jury is still out on how brilliant he was. What theory/theories did he propose that were found to be true/correct? I don't know of any. Could turn out he was just able to conjure up wonderful fantasies. translation: Controlled Peer Review networks and Controlled Media networks form a wake for their special education star. Died on Pi day. His life and his death... both amazing. Died on the day Einstein was born! Born on the day Galileo died, the same year Isaac Newton was born.